​Wright, N. (2011), 'A Journey Towards Organisation Development', Industrial & Commercial Training, Emerald Group Publishing Ltd, Vol 3, No7, pp 422-430. The first challenge OD practitioners often face is explaining to themselves and others precisely what OD is. Pause for a moment before reading further and imagine yourself with one minute to explain to someone who has never heard of OD, what it is. What would you say? Some people describe OD as a function, some as a process, some as an intervention. Others may compare and contrast it with related disciplines such as leadership, management consultancy or HR. In the UK, there is no single agreed definition and no single professional body representing OD, although CIPD, AMED and ITOL all lay some claim to this space. There are unclear boundaries with other professionals and practitioners enter OD from diverse backgrounds. In light of this, I won’t attempt to offer or prescribe a definitive view of OD, not least because some OD colleagues whom I know and respect would disagree with some of the perspectives I will present here. However, I will offer something like a buffet of perspectives, ideas, models etc. that you, the reader, are invited to pick and choose from. I would encourage you to weigh up what you read alongside your own ideas and experiences and wider research in the OD field. I think of OD in its broadest sense as a holistic, humanistic, systemic outlook and approach. The question I hold in the back of my mind is something along the lines of, ‘What human related factors are influencing (or have influenced, or are likely to influence) the organisation’s effectiveness?’ Common factors include culture (shared beliefs and behaviours), complexity (diversity and change), capability (abilities and opportunities) and climate (feelings and attitudes). Over the years, I’ve come to believe that how people feel is one of the most significant factors that influences an organisation’s success. How people feel impacts on their level of engagement and engagement, in turn, influences personal, team and organisational performance. How people feel is influenced by a whole range of factors including confidence in leadership, how well people’s aspirations and expectations are fulfilled, how well people work together in teams etc. In World Vision UK, we test how we’re feeling as well as how we’re doing organisationally by a variety of means including an annual Best Companies engagement survey and a quarterly pulse check, a mini-survey involving all staff. The results are published openly for all staff to see and leaders commit to specific actions based on what they’re hearing. This provides an organisational insight-feedback-accountability loop with on-going checks on route. In my own OD practice at World Vision UK, I have been involved in a diverse range of areas and initiatives alongside leaders, HR and other colleagues including: spirituality and values; culture and brand development and integration; leadership and management development; strategy and change leadership; engagement and internal communication; performance management and development; induction and teambuilding; talent and career development; knowledge and information management. The challenge can be how to create and maintain focus in the midst of so many opportunities, challenges and demands. In order to address this, I have produced a simple strategy map (Fig 1) which I used as a conversation starter with leaders and HR colleagues. It’s more indicative than definitive and aims to create a sense of coherence and a basis for collaborating and prioritising. As an overall idea, it proposes that if the lower conditions are fulfilled, the higher outcomes and goal will be achieved. A different way to approach OD would be through a more explicit people lens. I developed an alternative model (Fig 2) to emphasise that the organisation’s effectiveness is influenced by having the right people in place, engaged in the right conversations and doing the right things. It proposes that an important dimension of leadership is to attract, recruit, develop, deploy and retain the right people. The tricky part is that people come in all shapes and sizes and so a leadership challenge is how to enable imperfect people to work together well in motivating and effective teams to achieve the organisation’s goals. So, for instance, it’s possible to imagine a person who is very capable but has an unhelpful attitude that undermines his or her and others’ performance. It’s equally possible to imagine a very capable person who lacks moral character. It’s possible to imagine a person who is capable and ethical but who feels bored or disengaged. It’s equally possible to imagine a person who would be great in one context or environment, or at a particular time in an organisation’s life, but who is in the wrong role now or in an organisational culture that conflicts with his or her personal preferences or style. In light of this, I may pose questions along the following lines: ‘What opportunities or challenges will this person face in this role, culture and organisation? What will it take for him or her to be effective? What will it mean to demonstrate the organisation’s brand and cultural values in this role? What will good performance actually look like? What potential do we see in this person to fulfil wider roles in the future? What kind of person will succeed in this culture and contribute to it?’ These considerations feed into recruitment, talent management, performance and development conversations aimed at building the organisation and enabling it to achieve its goals through people. The cultural piece has been one of the most interesting and stimulating piece of OD work I’ve been involved with at World Vision UK because of its transformational potential. We invited staff across the whole organisation to contribute to a 1-day workshop exploring brand and culture, what it means to live the brand in practice. 70 staff turned up and, in small groups, we invited them simply to think back to a day when they felt really proud to work for World Vision, to discuss what made the greatest difference and then to depict their stories creatively to the wider group. We noticed these themes were interdependent. It’s a balance of all areas that results in high levels of engagement and performance. For instance, if we focus on relationship (‘partners’) without a corresponding emphasis on honesty (‘truth’), conversations can feel superficial. If we focus on being honest (‘truth’) without a corresponding emphasis on relationship (‘partners’), conversations can be insensitive. If we focus on inspiring people (‘passion’) without a focus on achieving results (‘impact’), we can be ineffective (Fig 3). 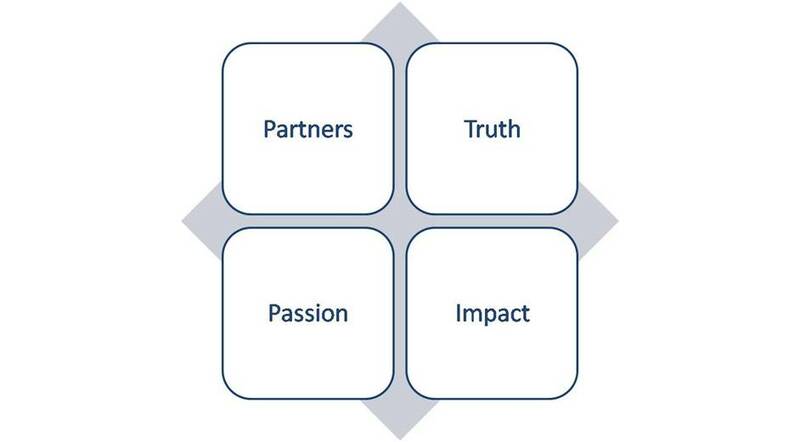 We use this conceptual framework for guiding leadership, communications etc. For instance, if I need to address a difficult performance issue, I remind myself to treat the person with respect and invite honest feedback as well as give it (‘partners’ + ‘truth’); I try to frame the conversation in such a way that leads to the person feeling positively motivated to change and thereby achieve the desired results (‘passion’ + ‘impact’). When we approach corporate all staff meetings, we remind leaders and other contributors to work collaboratively, be authentic, act creatively and emphasise outcomes. We refer to this underlying cultural principle as the ‘spirit of the brand’. We use it in induction to express what we aspire to be more like, more of the time. 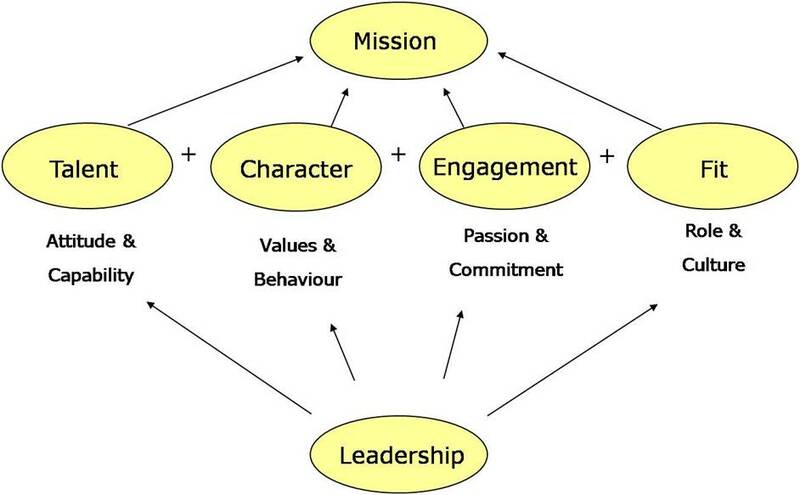 As part of our talent conversations with leaders during recruitment and succession etc, we use this framework to articulate the kind of organisation we aspire to be, the kind of people we are looking for, the kind of people who will fit culturally and contribute positively within World Vision UK, the kind of people who are most likely to be successful in our desired cultural environment. So, what kind of qualities or characteristics make OD practitioners successful? In 2009/10, the UK’s Institute of Employment Studies conducted interesting research in a number of organisations, exploring what different groups (senior leaders, HR, OD practitioners) thought about OD and what their expectations were. They summarised a number of common OD characteristics: working towards organisational effectiveness; an organisation-wide systemic approach; working in partnership with others; combining humanistic and business goals; facilitating and challenging. 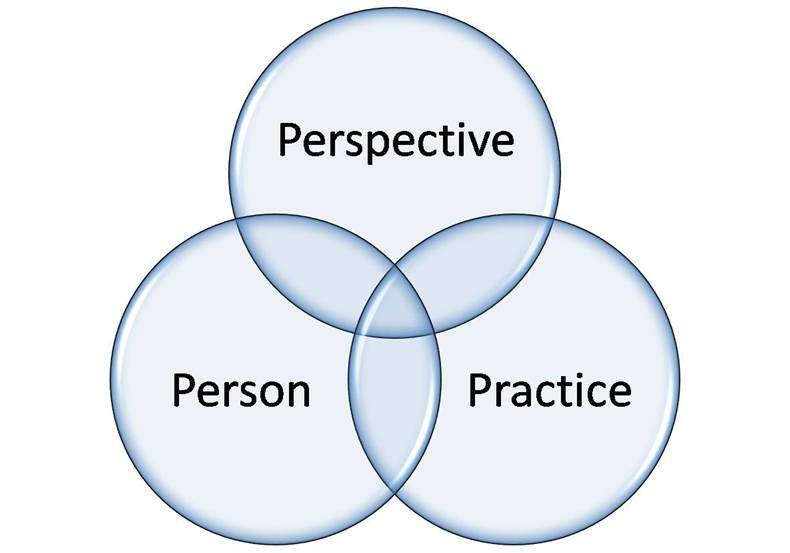 In my own experience, three interrelated elements are particularly significant for OD’s success: person, perspective and practice (Fig 4). Over and again I hear people comment on OD’s value in terms of the personal qualities displayed by the OD practitioner, e.g. good listener, empathetic, self-aware, insightful, diplomatic, challenging, optimistic, resilient and trustworthy. In World Vision UK as a Christian organisation, we would add ethical, prayerful and discerning to this list. There’s something about the person, the presence, the style and character of the OD practitioner that influences people and change. In light of this, I believe personal development is fundamental to professional development. I also hear people comment on the value and contribution of OD practitioners’ perspective, often described as an ‘unusual’ perspective. My own perspective has been influenced by Christian spirituality, social constructionism, systems thinking and various schools of psychology including psychodynamics, social psychology and gestalt. I formally studied theology and philosophy then organisational dynamics and culture, all of which have had a profound influence on my values, my worldview, how I see organisations, what I believe is significant in OD etc. I believe OD practitioners do well to invest in their own professional development through, for example, studies, research, journals, conferences and networks. It’s about growing in awareness, broadening horizons, keeping ideas up-to-date, drawing on others’ thinking and experience, contributing to others’ learning in the field. I believe the value we bring to an organisation is expanded or limited by the degree to which we tap into the wider OD arena, thereby enabling the organisation to gain access to that learning in that arena too. In one organisation I worked with, I encouraged my OD team colleagues to write journal articles as a method of professional development and sharing ideas with others. I believed that crystallising and articulating their thoughts and ideas in this way would sharpen their thinking, that receiving feedback from readers would stress test their ideas and that being published would build their professional confidence and credibility. I offered a bottle of champagne to the first team member to be published and I will never forget the bright smile on the L&D officer’s face when she received it. OD practitioners are also known for skilful practice. If ‘person’ is about who we are and ‘perspective’ about how we see the world, ‘practice’ is about what we do and how we do it. OD practitioners can be seen operating in organisations in a number of different modes and engaged in a variety of tasks, depending on the preferences and expertise of the OD practitioner, the expectations of the client and the needs and opportunities of the specific situation. An OD practitioner operating in, say, ‘consultant’ mode will need to demonstrate high quality consultancy and coaching skills, e.g. listening, contracting, reflecting back, challenging, reframing, sense-making, summarising. 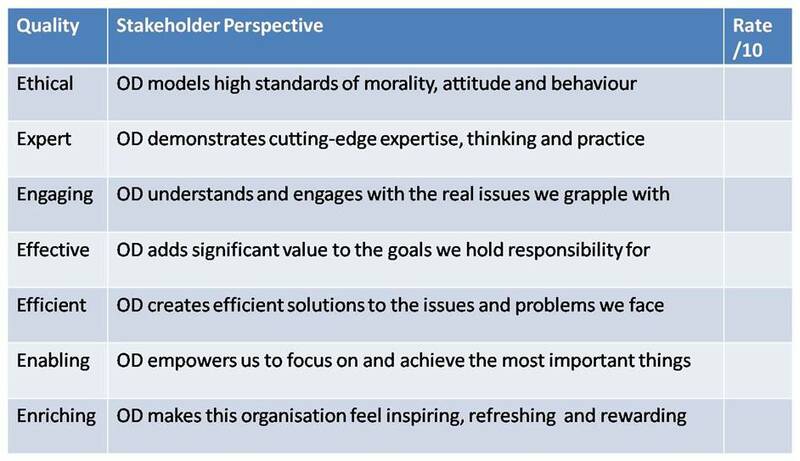 In this mode, the OD practitioner is typically holding up a metaphorical mirror to the client (normally a leader or leadership team), enabling him or her (or them, if a team) grow in self- and organisational awareness, explore options and implications and pursue a course of action that will enhance the person, team or organisation’s development. 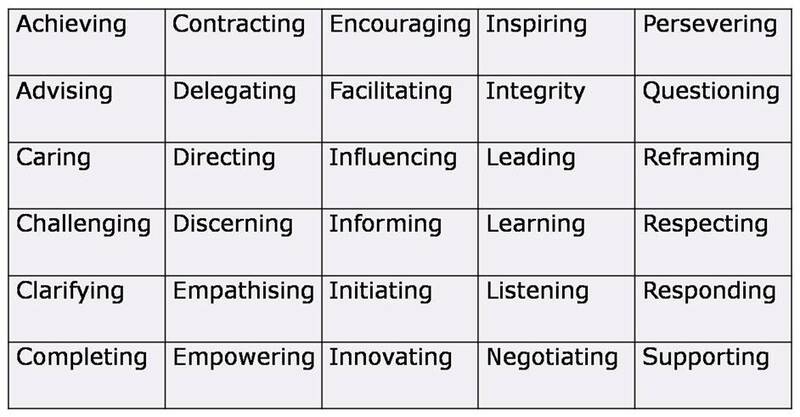 An OD practitioner operating in, say, ‘leadership’ mode will need to demonstrate high quality leadership and management skills, e.g. visioning, influencing, strategic thinking, programme management, stakeholder engagement, evaluation. In this mode, the OD practitioner is typically leading a specific OD programme or intervention (e.g. corporate leadership development programme) on behalf of the organisation, aimed at developing the organisation’s culture, capacity and capability for the future. In a recent OD consultancy assignment, I was invited to meet with regional leaders, listen to their issues, stories and aspirations and provide guidance on an OD strategy for the future. During these conversations, issues around strategy, structure, culture and capacity emerged as recurring themes. I noticed and fed back the interplay between these issues and the importance of high quality change leadership to navigate the organisation’s way through them. I provided coaching and mentoring on certain aspects and, as a result, the client has greater clarity and a roadmap for the way forward. In light of the demands of this kind of role and the opportunities to make a real difference if we do it well, I believe OD practitioners will benefit greatly from investing in their own on-going skills development, e.g. through training workshops, mentoring, action-learning, peer coaching. The key is to be open to and actively seek constructive critical feedback from clients and colleagues in order to identify skills strengths and areas for development. This demands humility, courage and a genuine desire to learn and grow. I once worked with an OD team that aspired to develop and establish for itself organisational credibility and influence as an internal learning consultancy. The team had its roots in L&D and recognised that it would need to shift its way of engaging with clients if it was to reshape client expectations as well as its role in the organisation. In order to achieve this goal, we ran a consultancy modes and skills workshop for the team followed by monthly peer consultancy sessions where team members could share experiences of working with clients, receive support and challenge and role play future scenarios. The principle here was to shape in the team’s own thinking, as well as that of its clients, a picture of what it would be to operate as a learning consultancy rather than traditional service provider. If the team members could hold a clear and compelling enough image in their own imagination, this would influence their intention and way of engaging which would, over time, shape their clients’ view of the OD team. So for instance, if the consultant learned to approach the client with strategic and systemic rather than operational and transactional issues in mind, this would create in the client’s mind an image of what type and level of issues to engage the OD consultant on. This assumes the OD practitioner has a vision and view of what he or she would like and can do to add value. The corresponding part of the equation is what clients want from OD - and the tricky part is sometimes navigating and negotiating respective expectations to reach an agreement that feels both fulfilling and worthwhile for all parties. I had one such experience when working as OD business partner with a leader of a change process. My expectation was that I would act as consultant-coach mode, his that I would lead the change on his behalf. It took some difficult conversations to reach agreement on roles and I had to learn to hold my nerve to avoid collusion. 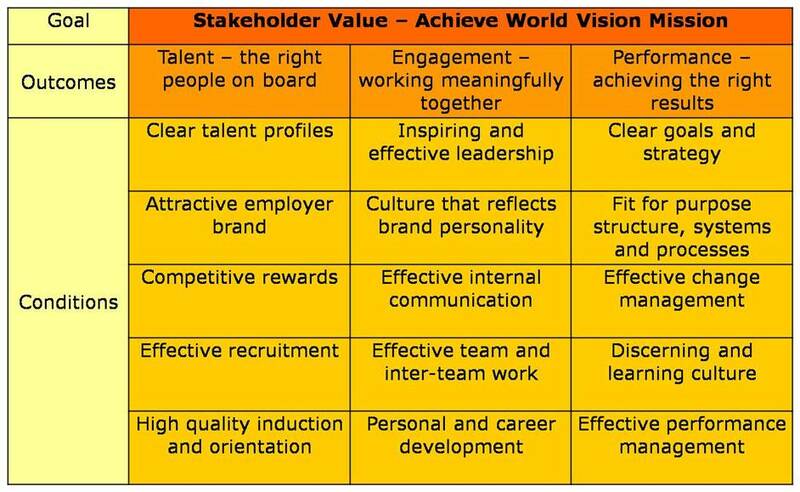 Over time, I’ve developed my own view of that clients typically look for from OD and I’ve summarised these in Fig 5 below as the basis upon which implicitly or explicitly clients are likely to evaluate our OD value and performance in World Vision UK. 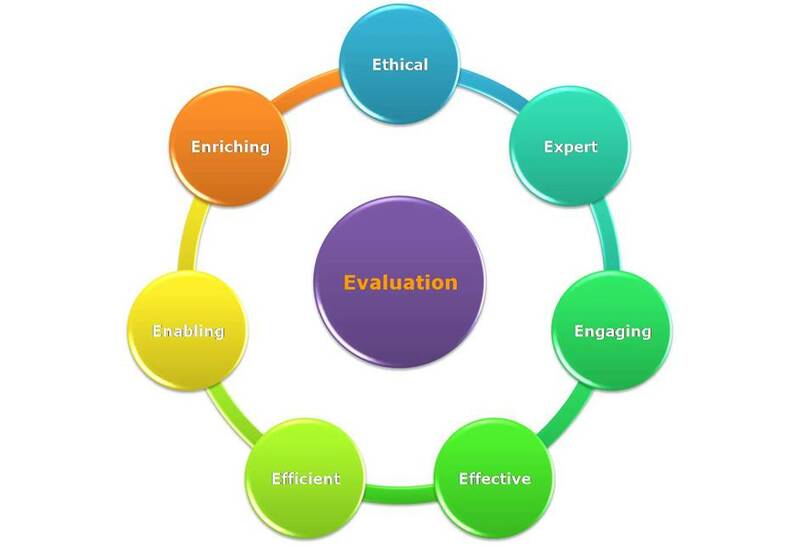 The areas suggested in this model are again indicative rather than definitive and I would encourage you as reader to explore what your own clients might include as corresponding evaluation criteria. I’ve amplified these criteria in Fig 6 as a mini-survey to discuss with clients in order to gain their feedback. I spoke at an international HR conference in 2010 and asked those present how many had a clear view of what their clients expected of or valued in them. No-one raised a hand. Similarly at an HRD conference in 2011, I asked participants how many had a clear strategy map they use with clients to explain their work, test assumptions and prioritise together. Again, no-one raised a hand. This suggests to me that OD practitioners and those in related fields could benefit from developing an explicit theory of organisational change, articulate that theory in a clear strategy map and work with clients on identifying and evaluating their contribution to achieving the desired change. At a personal level, I’ve identified a number of qualities and capabilities over the years that clients attribute my success or failure to as an OD practitioner and I periodically invite clients to provide me with feedback against these qualities and capabilities to see how well I’m doing and where I need to improve (Fig 7). This kind of survey is easily developed online, e.g. using a tool like Survey Monkey. I ask clients to highlight my top 5 strengths and top 3 development priorities and to give me a score out of 10 for how I’m doing overall. This kind of feedback provides me with valuable perspective on my own practice and focus for my personal and professional development plan. This article has explored OD thinking and practice from a range of perspectives, including the nature of OD as a professional discipline, OD modes of operation, qualities of the OD practitioner and stakeholder evaluation of OD performance. It has explained that there is no unified definition of OD in the UK, that OD looks different in different situations depending on what is needed and the personal preferences and outlooks of the OD practitioner and client. It has proposed that OD practitioners would benefit from developing and articulating clearer theories of change, strategies and evaluation criteria to establish greater credibility, influence and effectiveness in the future. Nick Wright is responsible for leadership and organisation development at World Vision UK (www.worldvision.org.uk), an international development, advocacy and relief organisation that recently achieved Best Companies star status and a place in the prestigious Sunday Times Top 100. Nick is a committed Christian who has a passion to humanise organisational environments and has written numerous articles to stimulate and develop reflective practice (www.nick-wright.com).